Operating Thursday and Friday Night, pick ups available from 5.30pm! Simply call the Club to book, 9606 0412! Austral, West Hoxton, Denham Court, Willowdale, Bringelly, Middleton Grange, Leppington, Rossmore! Please contact our friendly staff if your suburb is not shown here! The Austral Bowling Club Courtesy Bus is a service that operates for the benefit of Austral Bowling Club Members and the local Community. There are conditions to travelling on the Courtesy Bus which can be seen below. 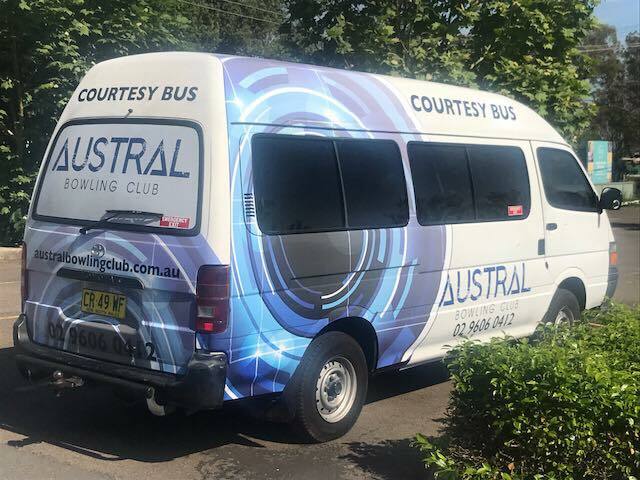 The Courtesy Bus is for members and guests of Austral Bowling Club only. Pick up and drop off points must be a residential address or public transport facility only. Every attempt will be made to adhere to schedules, but times may vary without notice. Rules and regulations which apply within the facility of Bankstown Sports Club, also extend to the confines of the Courtesy Bus. The courtesy bus driver is authorised to eject, any person in breach of Austral Bowling Club's rules and regulations. Offensive language, objectionable behaviour, smoking, and the consumption of food or beverages are not permitted on the Courtesy Bus. Routes may be altered without notice at the discretion of the driver.